Emergency crews were called to help the men. Picture: Herne Bay Coastguard. 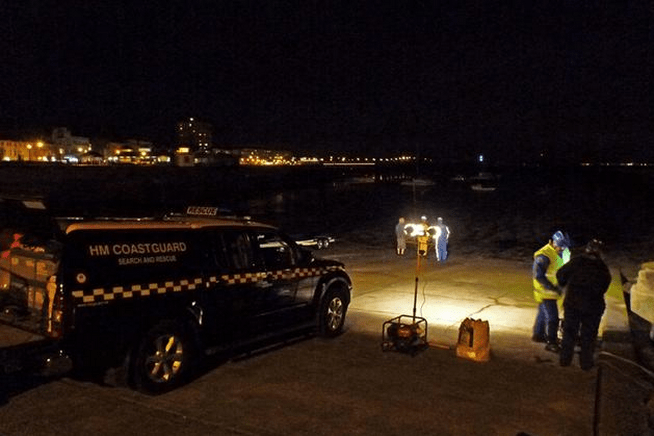 Two people were rescued from a speedboat after it got stuck in mud 100 metres off Herne Bay last night (April 24). Whilst on a water rescue training session, the Herne Bay Coastguard Rescue Team was called to a report of two people stranded onboard an offshore powerboat that was stuck 80 metres from the slipway in the infamous deep mud of Herne Bay Harbour. The team, which was called to the incident just before 8.30pm, swiftly deployed mud rescue equipment and was able to retrieve both casualties. The boat was secured awaiting the next high tide when the owner planned to retrieve it. At 11.55pm, all equipment had been washed down and the Herne Bay Coastguard Rescue Team left the station.